Same thing, even have the lines on the board where it stuck out past the paper. Grumble...I'll do some digging on a fix. Thanks though, Gerry. Ryan do you scan through the scanners window, or use another programme like photoshop or irfan? I use the BearPaw/ScanExpress window. I just ran through a few scans with the cover off and the streaks show up on everything, even a "blank" image. Damn strange. and put the lid down! :^) Just playing around with it. The streaks are still there with Irfan. Must be a hardware problem. I'm also going to try un- and re-installing the software, you never know. The cover was always closed except a couple of times while I was experimenting. Since they look like light leaks, I even put my jacket over the scanner, no luck. Looking at three separate scans, the streaks are all in the same place. It's a hardware problem, I'll probably have to open the sucker up and clean the scanning bar or whatever it's called. Sorry for highjacking the thread. I noticed I got scanlines with my Mustek if I scan over 72 dpi and have other programs opened. could it be the glass ? Definitely not the glass. I'll shut everything else down and try Gil's idea out. 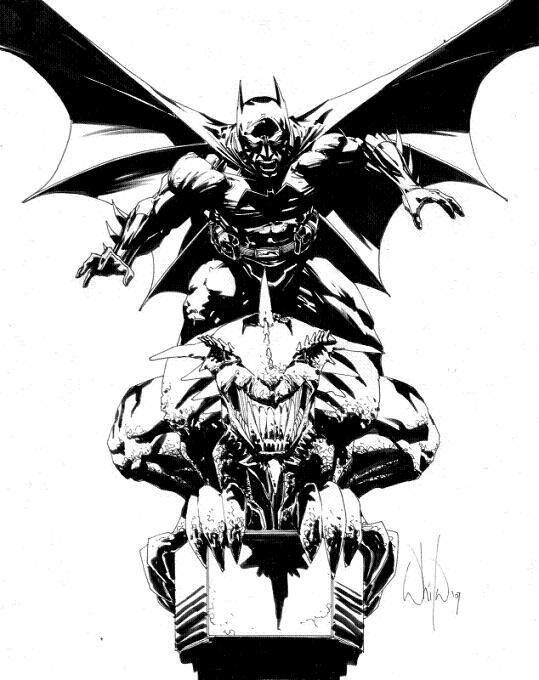 Curious how much it costs to commission Hembeck to do a cover recreation? Those ASM covers are awesome! Here is a much nicer scan of the JB page I bought recently. Having Mr. Byrne's signature means a lot to me, as he was my first 'favorite' artist when I became old enough to realize that someone actually had to write and draw these things (ca.1970's Iron Fist and Uncanny X-Men). I bought this piece because it reminds me of what it was like to read comics when I very first discovered them. I'd have loved seeing this at the drug store on a Saturday afternoon with my Dad. My pals and I so wished he'd draw Superboy! Can someone tell me what is 2 ply plate bristol? Is it the same paper used to draw comics on? Have you tried placing a dark, slightly heavy (but not too heavy) hardcover book on top of the art to flatten it against the scanner's glass? I had that problem with an earlier scanner (though strangely not with my Mustek A3) where I needed to make sure there was no "air" between the glass and the artwork. The scanner sort of created it's own "glare effect" when the art was just slightly "buckled". 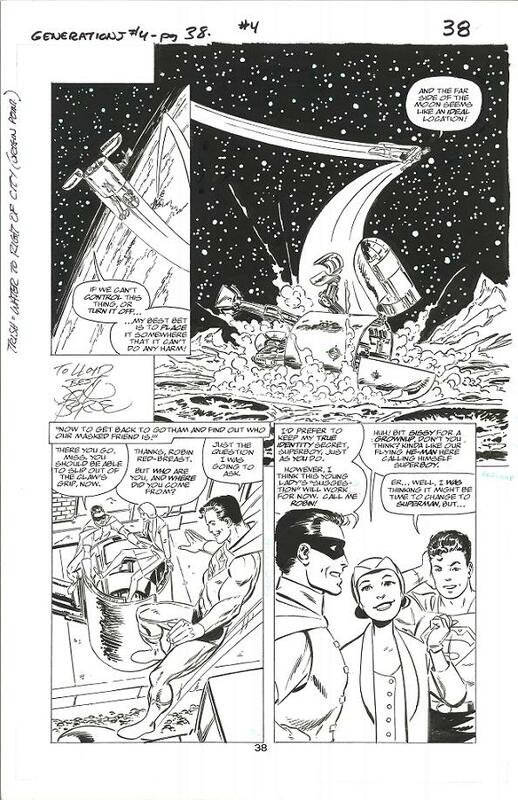 Bristol board is the standard type of paper that comics are drawn on. It's not as heavy or thick as cold-press board or cardboard, but sturdier than regular paper. The term "plate" refers to the surface texture of the board. Plate bristol has a smoother surface than regular finish, which is also known as "kid" finish, which has a slightly rougher, "toothier" texture to it. Neither is superior to the other; it's a matter of preference and taste which type of paper is preferred by artists. Inkers tend to prefer the plate finish, because pen nibs and crowquills can snag in textured paper and cause unwanted splatters. The term "ply" refers to the number of layers comprising the board. Each thin layer, or ply, creates a thicker, sturdier board. Two ply is standard because it's sturdy enough to stand up to heavy erasing and inking, and yet is still thin enough to be used effectively on a lightbox. Heavier paper is more difficult to see through, but better for paint and ink wash finishes. Strathmore is the industry standard although different artists have different preferences in brands as well as types of paper. Canson also makes a good board. Thanks for the answer, Glenn. A sketch my friend got at the latest Irish convention. Sort of a preview of an upcoming issue. Thats a nice Nazi Ape youv'e got there David. He's one of a bunch of Nazi monkey henchmen that will be appearing in the next issue of the Irish comic Freakshow. Cheers David nice to know.